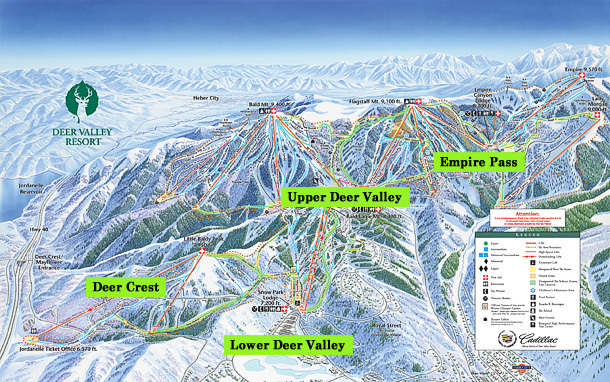 Deer Valley Ski Resort offers many ski-in, ski-out homes and condos throughout different locations of the resort's mountains, valleys and surrounding areas. Deer Valley is most well known for luxurious mountain homes located on the ski slopes of Deer Valley ski runs. Deer Valley is now also home to some of Park City's most exclusive luxury condominium hotels such as Stein Eriksen Lodge, St. Regis Deer Crest, and the Montage Deer Valley in Empire Pass. Continually rated as a top North American ski resort (#1 five years in a row) by readers of SKI Magazine, Deer Valley is the premier location to own property in the greater Park City area. With world-class skiing in the winter, and boating and mountain biking in the summer, owning a home or condo in Deer Valley has grown to offer amazing four season recreation unmatched by any other ski resort or mountain town. Listing information last updated on April 19th, 2019 at 11:28am MDT.